Bill Clinton Says His Wife's Brain Is Just Fine, Thank You : It's All Politics The former president said Republican strategist Karl Rove's recent remarks about Hillary Clinton's health are "just the beginning" of the attacks that are headed her way. 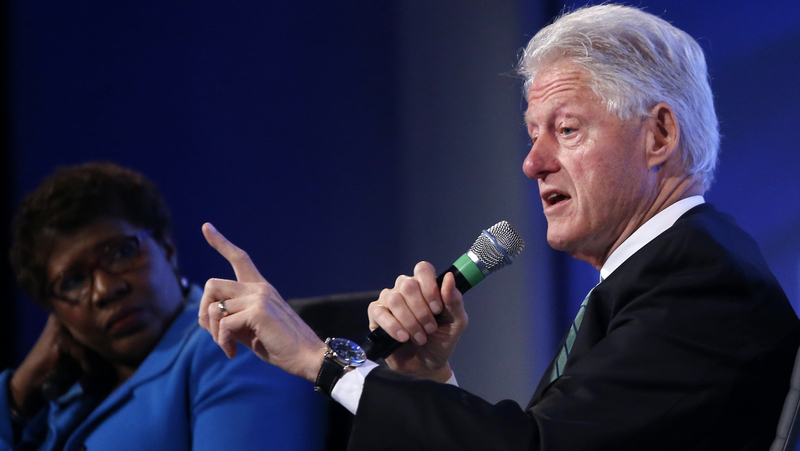 Former President Bill Clinton answers questions Wednesday from Gwen Ifill of PBS NewsHour at the 2014 Fiscal Summit organized by the Peter G. Peterson Foundation in Washington. Bill Clinton says he was "dumbfounded" by Republican strategist Karl Rove's recent comments about Hillary Clinton's brain. But the former president was hardly left speechless. "First they say she was faking her concussion; now they say she's auditioning for a part on The Walking Dead," Clinton said on Wednesday when asked about Rove's remark that Hillary may have suffered "brain damage" from a fall in 2012. "She is strong; she is doing great. As far as I can tell, she's in better shape than I am," Clinton said of his wife. He added that he expects Republican strategists to do "whatever it takes" as Mrs. Clinton weighs her decision about running for president in 2016. Clinton was speaking in Washington at the 2014 Fiscal Summit, sponsored by the Peterson Foundation. The topic was economic and fiscal policy choices. But PBS journalist Gwen Ifill, who was interviewing Clinton on a stage, asked about Rove, who recently said the former secretary of state had "hidden" information about her possible "brain damage" suffered in a 2012 fall. "You can't be too upset about it," he said, because Rove's remarks were "just the beginning" for his wife. "They'll just get better and better." The former president stuck in another jab, this one about an alleged scandal from the 1990s. "I'm still waiting for them to admit there's nothing to Whitewater," Clinton said.